a request from Acadian Ambulance asking for "whatever we can send" we were able to supply 2 units to aid in the relief and rescue efforts. New Orleans rescue workers, as well as with services from other areas. Early on, we ran into a squad from West Virginia, which was a welcome site to see people from "our direction" on the ground helping. I only wish we could have sent more trucks, sooner than we did, but am very glad that we could help out in such a large scale event. Below are some photographs that we took, plus some that were sent to us from other people. This was quite an experience and we were able to meet and work with some of the best in our field! Above Scott and John get to meet and work under US Army General Honore the "Ragin Cajun"
Above is a view of the EOC parking lot on World Center Drive on Saturday 9-3-05, after several more ambulances began to arrive to help us out. Above is our unit passing in front of the New Orleans Convention Center. We transported many patients INTO this location to a MASH style hospital that was set up. And then transported many of them to the New Orleans Airport to another MASH style hospital, for triage and air transport to other locations. 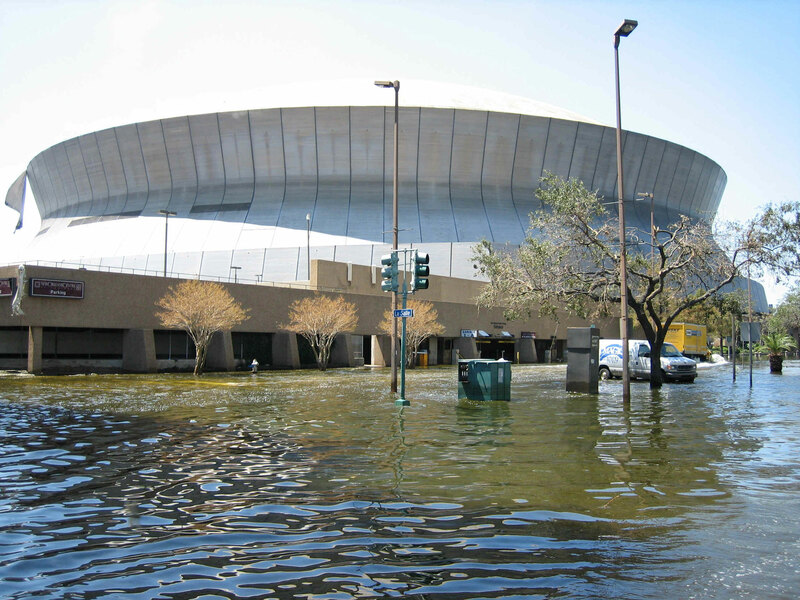 Above is the water near the Super Dome that we drove our unit 11 thru to get to people, that was not such a great idea. It was necessary, although began a long line of problems, which never stopped our unit, although it slowed it a bit! It never dawned on us, being from the Ohio Valley, that the water here, was salt water! "Data from an Air Force reserve unit reconnaissance aircraft: along with observations from the Bahamas and nearby ships...indicate the broad low pressure area over the southeastern Bahamas has become organized enough to be classified as tropical depression twelve." this morning and has strengthened into tropical storm Katrina." 5:00 PM EDT: The National Hurricane Center upgrades tropical storm Katrina to "Hurricane Katrina". 7:00 PM EDT: Katrina makes landfall in Florida. 11:30 AM EDT: Katrina is upgraded to a Category 2 hurricane. 5:00 PM EDT: The National Hurricane Center issues an advisory forecasting that Katrina would soon be a Category3 hurricane. 5:00 PM CDT: Louisiana Governor Kathleen Babineaux Blanco declares a state of emergency for Louisiana (see public document). Mississippi Governor Haley Barbour declares a state of emergency for Mississippi (see public document). President George W. Bush's weekly radio address focuses on Gaza withdrawal and the Iraqi constitution. He makes no mention of Hurricane Katrina. President Bush officially declares that a "state of emergency" exists in Louisiana and orders Federal aid to the affected areas to complement state and local relief efforts. 5:00 PM CDT: New Orleans Mayor C. Ray Nagin declares a State of Emergency and issues a voluntary evacuation order, saying he is having his legal team determine if he can order a mandatory evacuation without exposing the city to legal liability for the closureof hotels and other businesses. 11:00 PM EDT: the National Hurricane Center issues a warning suggesting that Katrina is moving in a western direction in an area that includes New Orleans. 1:00 AM CDT: Katrina is declared a Category 4 storm. 8:00 AM EDT: Katrina is declared a Category 5 storm, the highest possible rating. Approx. 10:00 AM CDT: New Orleans Mayor Ray Nagin orders mandatory evacuations of New Orleans. Louisiana Governor Blanco sends letter to President Bush requesting various federal aid. President Bush declares a state of emergency for both Mississippi and Alabama, and declared Florida a federal disaster area in light of damage done by Hurricane Katrina. Afternoon: Director of the National Weather Service (NWS) National Hurricane Center (NHC), Max Mayfield, personally briefs President Bush about Katrina by video conference. 6:10 AM CDT: Katrina, a Category 4 hurricane with 145 mph winds, makes initial landfall near Buras, La. and gave them two days to arrive. and crashed through the floodwall, opening a breach that accelerated flooding into the Lower Ninth Ward and St. Bernard Parish." 8 feet of water expected in the 9th Ward and Arabi. Approx. 9:00 AM CDT: Eye of hurricane Katrina passes over city of New Orleans. 6 to 8 feet of water covers New Orleans Lower 9th Ward. breach at 3 AM, three hours before the storm made landfall. 2:00 PM CDT: City officials publicly confirm breach of 17 Street Canal levee. President Bush makes emergency disaster declarations for Louisiana , Mississippi, and Alabama, freeing up federal funds. Katrina rips two holes in the Superdome's roof. Some 10,000 storm refugees are inside. At least eight Gulf Coast refineries shut down or reduce operations. FEMA Head Michael Brown urges emergency service personnel "not to respond to hurricane impact areas unless dispatched by state, local authorities." The American Red Cross announces that it is "launching the largest mobilization of resources in its history" to assist Katrina victims. FEMA encourages the public to donate to this and other private organizations involved in relief work. speech is dedicated to the need to "stay the course" in Iraq. 9:24 AM PDT: The AP reports that President Bush will cut short his vacation to focus on the storm damage. the New Orleans convention center. 10:00 PM CDT: New Orleans Mayor Ray Nagin announces that the planned sandbagging of the 17th Street Canal levee breach has failed. "Late Tuesday": DHS Secretary Michael Chertoff declares Katrina an 'Incident of National Significance', "triggering for the first time a coordinated federal response to states and localities overwhelmed by disaster." Declaration is first use of DHS National Response Plan. he can view the devastation. Louisiana Gov. Blanco issues order for emergency occupation of hotel and motel rooms (see public document). Louisiana Gov. Blanco issues order authorizing the commandeering and use of buses for evacuation and relief efforts (see public document). first buses leaving for Houston's Astrodome, 350 miles away. and a curfew is placed in effect. Mayor Ray Nagin calls for increased federal assistance. 11:09 PM: The Times-Picayune reports that 3,000 or more evacuees are stranded at the convention center. The (suburban Chicago) Daily Herald reports that House Majority Leader Dennis Hastert says rebuilding New Orleans "doesn't make sense to me." armada of Federal support." Bush responds by noting that "I don't think anybody anticipated the breach of the levees. They did anticipate a serious storm." At around the same time, evacuees from the New Orleans area and the Louisiana Superdome begin arriving at the Astrodome in Houston, Texas. FEMA announces guidelines to contractors interested in "doing business with FEMA during the Hurricane Katrina recovery." Looting, carjacking and other violence spreads, and the military decides to increase National Guard deployment to 30,000. New Orleans mayor Nagin calls the situation critical and issues ``a desperate SOS'' for more buses to evacuate those stranded at the Convention Center. Bush asks his father and former President Clinton to lead a fund-raising campaign for hurricane victims. On NPR’s All Things Considered, Chertoff claims, "I have not heard a report of thousands of people in the convention center who don't have food and water." The Reliant Center in Houston is opened to evacuees when the Fire Marshal declares the Astrodome to be at capacity. determined not to be credible. President Bush tours Alabama, Mississippi and Louisiana to survey Katrina's damage. He describes the result of relief efforts up to that point as "not acceptable." National Guard arrives in New Orleans. FEMA releases a statement: "patience in the wake of Hurricane Katrina." Congress approves and President Bush signs an initial $10.5 billion aid package for immediate rescue and relief efforts. New Orleans, citing the poverty of the victims as a primary reason for the delay. The Bush administration asks Louisiana Governor Kathleen Blanco to request a federal takeover of relief efforts. The move would have given the federal government control over Louisiana's National Guard and local police. The state eventually rejected the proposal. maybe anybody's foresight." CNN reports that "government officials, scientists and journalists have warned of such a scenario for years." federal government's response to the catastrophe. Governor Kathleen Blanco (D-La) hires James Lee Witt, FEMA director under President Clinton, to advise her during the relief effort. DHS Secretary Michael Chertoff and other Bush aides hold two hour meeting with members of the Congressional Black Caucus and other black leaders. 4 PM: the Department of Homeland Security releases a document of "Highlights of the United States Government Response to the Aftermath of Hurricane Katrina." FEMA establishes a hotline to collect donations for assisting victims. Jefferson Parrish president Aaron Broussard claims on Meet the Press that aid to his Parrish was blocked by FEMA. President Bush returns for second visit to the Gulf Coast region. Again responding to the call, first from Louisianna then Texas! Below EMT At the Alamo! Sleeping Arrangements were a bit primative! We had several of our Medic's "answer the call" in New Orleans and surrounding gulf cost areas. 1200 Miles from home, we arrived after getting a request from Acadian Ambulance asking for "whatever we can send" we were able to supply 2 units to aid in the relief and rescue efforts. We left Tuesday and arrived in New Orleans Wednesday August 31st and quickly began to transport both medical patients, as well as simple "evacuee's" from waterside to the local mobile hospitals and other evacuation points. We were honored to work hand in hand with both local New Orleans rescue workers, as well as with services from other areas. Early on, we ran into a squad from West Virginia, which was a welcome site to see people from "our direction" on the ground helping. I only wish we could have sent more trucks, sooner than we did, but am very glad that we could help out in such a large scale event. Below are some photographs that we took, plus some that were sent to us from other people. This was quite an experience and we were able to meet and work with some of the best in our field! • 5:00 PM EDT: National Hurricane Center announcement: "Data from an Air Force reserve unit reconnaissance aircraft...along with observations from the Bahamas and nearby ships...indicate the broad low pressure area over the southeastern Bahamas has become organized enough to be classified as tropical depression twelve." • 11:00 AM EDT: National Hurricane Center announcement: "Satellite imagery...Doppler radar data from the Bahamas and Miami... and reconnaissance wind data indicate [tropical depression twelve] has become much better organized this morning and has strengthened into tropical storm Katrina." • 5:00 PM EDT: The National Hurricane Center upgrades tropical storm Katrina to "Hurricane Katrina". • 7:00 PM EDT: Katrina makes landfall in Florida. • 11:30 AM EDT: Katrina is upgraded to a Category 2 hurricane. • 5:00 PM EDT: The National Hurricane Center issues an advisory forecasting that Katrina would soon be a Category 3 hurricane. • 5:00 PM CDT: Louisiana Governor Kathleen Babineaux Blanco declares a state of emergency for Louisiana (see public document). • Mississippi Governor Haley Barbour declares a state of emergency for Mississippi (see public document). • President George W. Bush's weekly radio address focuses on Gaza withdrawal and the Iraqi constitution. He makes no mention of Hurricane Katrina. • President Bush officially declares that a "state of emergency" exists in Louisiana and orders Federal aid to the affected areas to complement state and local relief efforts. • 5:00 PM CDT: New Orleans Mayor C. Ray Nagin declares a State of Emergency and issues a voluntary evacuation order, saying he is having his legal team determine if he can order a mandatory evacuation without exposing the city to legal liability for the closure of hotels and other businesses. • 11:00 PM EDT: the National Hurricane Center issues a warning suggesting that Katrina is moving in a western direction in an area that includes New Orleans. • 1:00 AM CDT: Katrina is declared a Category 4 storm. • 8:00 AM EDT: Katrina is declared a Category 5 storm, the highest possible rating. • Approx. 10:00 AM CDT: New Orleans Mayor Ray Nagin orders mandatory evacuations of New Orleans. • Louisiana Governor Blanco sends letter to President Bush requesting various federal aid. • President Bush declares a state of emergency for both Mississippi and Alabama, and declared Florida a federal disaster area in light of damage done by Hurricane Katrina. • Afternoon: Director of the National Weather Service (NWS) National Hurricane Center (NHC), Max Mayfield, personally briefs President Bush about Katrina by videoconference. • 6:10 AM CDT: Katrina, a Category 4 hurricane with 145 mph winds, makes initial landfall near Buras, La. • FEMA director Michael Brown waits 5 hrs after Katrina has hit to ask his boss, Michael Chertoff, for 1000 Homeland Security employees to be sent to the region and gave them two days to arrive. • Shortly before 8:00 AM CDT: Storm surge sends water over the Industrial Canal. Soon afterwards, Army Corps of Engineers officials believe "a barge broke loose and crashed through the floodwall, opening a breach that accelerated flooding into the Lower Ninth Ward and St. Bernard Parish." • 8:14 AM CDT: The National Weather Service New Orleans office issues a flash flood warning stating there had been a breach in the Industrial Canal levee with 3 to 8 feet of water expected in the 9th Ward and Arabi. • Approx. 9:00 AM CDT: Eye of hurricane Katrina passes over city of New Orleans. • Approx. 9:00 AM CDT: 6 to 8 feet of water covers New Orleans Lower 9th Ward. • Late morning: 17th Street Canal levee is breached. Other reports place the breach much earlier. According to Knight-Ridder, a National Guard timeline places the breach at 3 AM, three hours before the storm made landfall. • 2:00 PM CDT: City officials publicly confirm breach of 17 Street Canal levee. • President Bush makes emergency disaster declarations for Louisiana , Mississippi, and Alabama, freeing up federal funds. • Katrina rips two holes in the Superdome's roof. Some 10,000 storm refugees are inside. • At least eight Gulf Coast refineries shut down or reduce operations. • FEMA Head Michael Brown urges emergency service personnel "not to respond to hurricane impact areas unless dispatched by state, local authorities." • The American Red Cross announces that it is "launching the largest mobilization of resources in its history" to assist Katrina victims. FEMA encourages the public to donate to this and other private organizations involved in relief work. • 9:04 AM PDT: President Bush delivers a speech in San Diego on the 60th anniversary of V-J Day. President begins speech with brief remarks on hurricane relief efforts, tells audience, "The federal, state and local governments are working side-by-side to do all we can to help people get back on their feet." Remainder of the speech is dedicated to the need to "stay the course" in Iraq. • 9:24 AM PDT: The AP reports that President Bush will cut short his vacation to focus on the storm damage. • Louisiana Gov. Kathleen Blanco says everyone still in New Orleans an estimated 50,000 to 100,000 people must be evacuated. Crowds swell at the Superdome and the New Orleans convention center. • Approx. 3:30 PM CDT: At press conference with Sen. Landrieu, Gov. Blanco and others, FEMA official Bill Lokey tells press: "In the metropolitan area in general, in the huge majority of areas, it's not rising at all. It's the same or it may be lowering slightly. In some parts of New Orleans, because of the 17th Street breach, it may be rising and that seemed to be the case in parts of downtown. I don't want to alarm everybody that, you know, New Orleans is filling up like a bowl. That's just not happening." • 10:00 PM CDT: New Orleans Mayor Ray Nagin announces that the planned sandbagging of the 17th Street Canal levee breach has failed. • "Late Tuesday": DHS Secretary Michael Chertoff declares Katrina an 'Incident of National Significance', "triggering for the first time a coordinated federal response to states and localities overwhelmed by disaster." Declaration is first use of DHS National Response Plan. • President Bush heads back to Washington from vacationing in Crawford, TX. Though he does not land in Louisiana, Air Force One flies over the Gulf Coast so that he can view the devastation. • Louisiana Gov. Blanco issues order for emergency occupation of hotel and motel rooms (see public document). • Louisiana Gov. Blanco issues order authorizing the commandeering and use of buses for evacuation and relief efforts (see public document). • HHS Secretary Michael Leavitt makes determination that public health emergencies exist in the states of Alabama, Florida, Louisiana, and Mississippi (see public document). • Shortly after 5 PM: President Bush holds a press conference in the Rose Garden of the White House during which he details his strategy for short-term recovery efforts. • Governor Kathleen Blanco of Louisiana orders that all of New Orleans, including the Superdome, be evacuated. An exodus from the Superdome begins, with the first buses leaving for Houston's Astrodome, 350 miles away. • 11:09 PM: The Times-Picayune reports that 3,000 or more evacuees are stranded at the convention center. • The (suburban Chicago) Daily Herald reports that House Majority Leader Dennis Hastert says rebuilding New Orleans "doesn't make sense to me." • 7:00 AM: President Bush appears on ABC News' Good Morning America. Diane Sawyer asks the President, " what's taking so long?" after telling Bush that "some of the things they have asked our correspondents to ask you is, they expected, they say to us, that the day after this hurricane that there would be a massive and visible armada of Federal support." Bush responds by noting that "I don't think anybody anticipated the breach of the levees. They did anticipate a serious storm." • At around the same time, evacuees from the New Orleans area and the Louisiana Superdome begin arriving at the Astrodome in Houston, Texas. • FEMA announces guidelines to contractors interested in "doing business with FEMA during the Hurricane Katrina recovery." • Looting, carjacking and other violence spreads, and the military decides to increase National Guard deployment to 30,000. 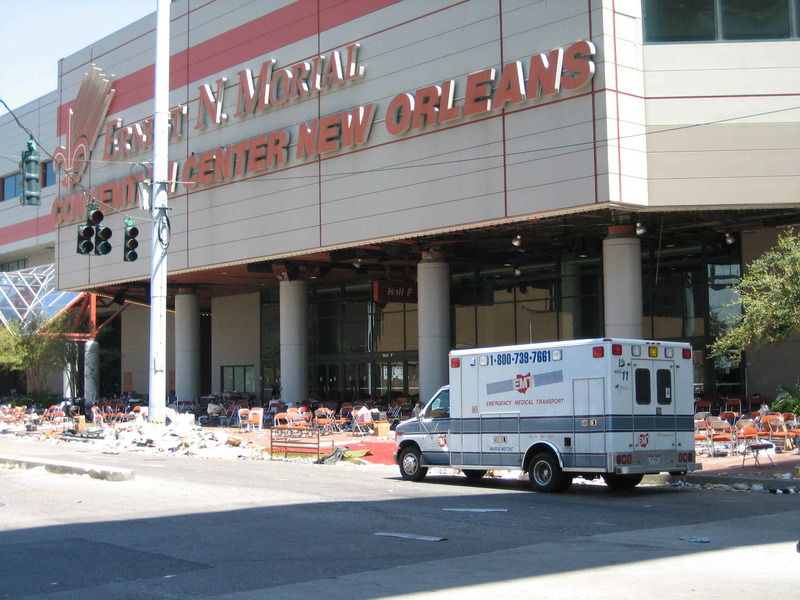 • New Orleans mayor Nagin calls the situation critical and issues ``a desperate SOS'' for more buses to evacuate those stranded at the Convention Center. • Bush asks his father and former President Clinton to lead a fund-raising campaign for hurricane victims. • On NPR’s All Things Considered, Chertoff claims, "I have not heard a report of thousands of people in the convention center who don't have food and water." 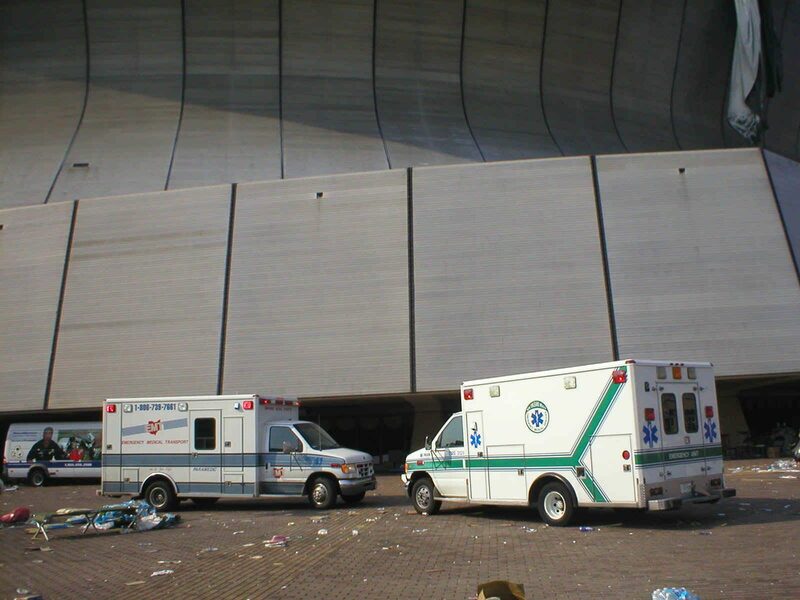 • The Reliant Center in Houston is opened to evacuees when the Fire Marshal declares the Astrodome to be at capacity. • A chemical plant explosion rocks New Orleans in the early hours of the morning. Rumors that the chemical cloud produced by the explosion was toxic were later determined not to be credible. • Louisiana Gov. Blanco issues second order authorizing the commandeering and use of buses for evacuation and relief efforts; order of August 31st rescinded (see public document). • President Bush tours Alabama, Mississippi and Louisiana to survey Katrina's damage. He describes the result of relief efforts up to that point as "not acceptable." • National Guard arrives in New Orleans. • FEMA releases a statement: "patience in the wake of Hurricane Katrina." • Congress approves and President Bush signs an initial $10.5 billion aid package for immediate rescue and relief efforts. • The Congressional Black Caucus, along with the NAACP, Black Leadership Forum, and the National Urban League express dismay over the sluggish relief efforts in New Orleans, citing the poverty of the victims as a primary reason for the delay. • The Bush administration asks Louisiana Governor Kathleen Blanco to request a federal takeover of relief efforts. The move would have given the federal government control over Louisiana's National Guard and local police. The state eventually rejected the proposal. • Homeland Security Secretary Michael Chertoff declares that Katrina constituted "a combination of catastrophes exceeded the foresight of the planners, and maybe anybody's foresight." CNN reports that "government officials, scientists and journalists have warned of such a scenario for years." • Chertoff also asserts that "our constitutional system really places the primary authority in each state with the governor," in response to a question about the federal government's response to the catastrophe. • Governor Kathleen Blanco (D-La) hires James Lee Witt, FEMA director under President Clinton, to advise her during the relief effort. • DHS Secretary Michael Chertoff and other Bush aides hold two hour meeting with members of the Congressional Black Caucus and other black leaders. 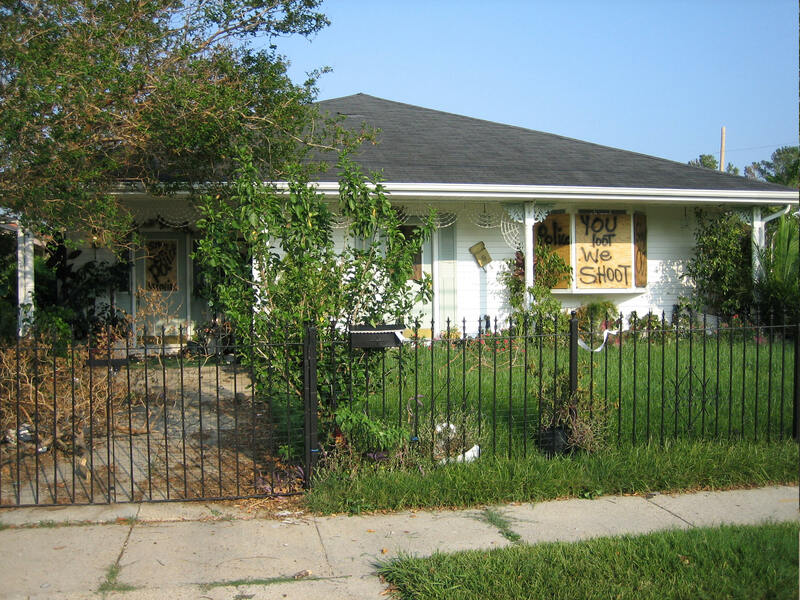 • 4 PM: the Department of Homeland Security releases a document of "Highlights of the United States Government Response to the Aftermath of Hurricane Katrina." • FEMA establishes a hotline to collect donations for assisting victims. • Jefferson Parrish president Aaron Broussard claims on Meet the Press that aid to his Parrish was blocked by FEMA. • President Bush returns for second visit to the Gulf Coast region. Citing "a national emergency", President Bush suspends the Davis-Bacon Act in storm ravaged areas of Alabama, Florida, Louisiana, and Mississippi. President Bush meets with Speaker Hastert and Senator Frist to discuss a "joint bipartisan investigation" of the response to Katrina. 9:49 AM EDT: The AP reports that Former Secretary of State Colin Powell, in a 20/20 interview to be aired later that night, criticizes the response at all levels of the government to Hurricane Katrina, saying "When you look at those who weren't able to get out, it should have been a blinding flash of the obvious to everybody that when you order a mandatory evacuation, you can't expect everybody to evacuate on their own. These are people who don't have credit cards; only one in 10 families at that economic level in New Orleans have a car. So it wasn't a racial thing — but poverty disproportionately affects African-Americans in this country. And it happened because they were poor." New Orleans Times Picayune runs front page banner headline: "Death Toll May Not Be as High as Feared." The Army Corps of Engineers reports that it has closed the final breach in the 17th Street Canal and London Avenue Canal systems.